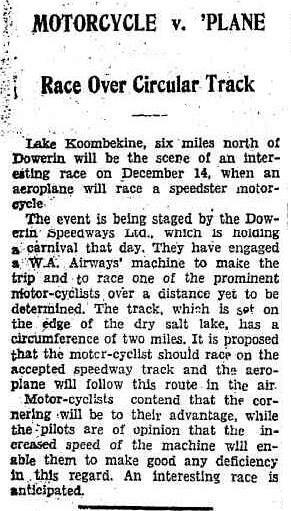 Dowerin's Lake Koombekine Speedway opened on the 4th of December 1929, Car racing was conducted at the circuit, The track was a perfectly round one mile dirt circuit. Between 1927 and 1939, Dowerin hosted two of the major race tracks in West Australia, Firstly the Lake Koombekine track and then the Dowerin Showgrounds track, The second world war brought an end to all racing, After the war and when racing resumed most of the competitors moved to the new track at the Caversham Airfield near Perth. To date the only information we have on the location is that the track was seven miles out of town, at Lake Koombekine.